The Telangana government has made the way of applying birth certificate much easier. Now parents can easily download the application form online and fill the form with the basic information and details necessary required in it. Every, parent can apply for inclusion of their child through birth certificate by applying it through meeseva centers manually. After filling all the above necessary details correctly as per the form you have submitted in Hospital register, then include your name and address in it along with your telephone number. Then you have to sing your signature and then apply the application form to Meeseva center nearby. You will have to pay the Meeseva center prescribed fees upto Rs.25, to upload and submit your Child birth certificate application form to online. 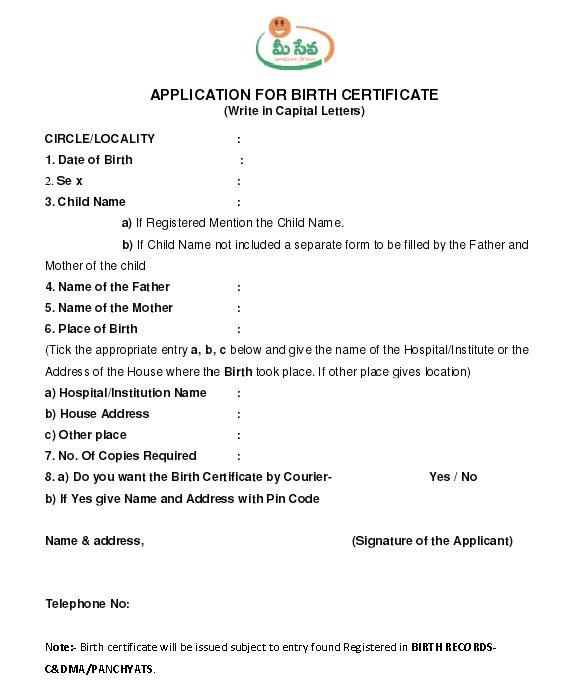 After filling that application form you will be given an Application number which can be used later on to check the birth certificate status details. After applying for birth certificate you can later, check the status for the applied application through online. You will require your Application number for checking its status. So, follow my steps to check the status carefully. HOW MANY DAYS IT WILL TAKE TO ISSUE CASTE CERTIFICATE AFTER APPLY ?